Welcome to the gîte de la Madeleine ! 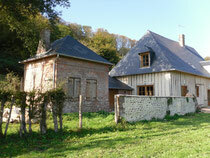 This typical Normandie guest house, with its five spacious rooms, can accommodate up to 12 people, all year long. It is located in a nature sanctuary, at the very heart of the Pays d’Auge. La Madeleine is a former cider mill from the 18th century. It has been entirely restaured in 2010 - 2011. It is the perfect place for a nice, relaxing holiday with your family or your friends, as it is really charming and has all modern conveniences. The house is surrounded by approximately four hectares of meadow and woods. A pretty river runs down the house: it is called the Orbiquet and is amongst the best french rivers for fishing salmons and sea trouts! From the gîte de la Madeleine, you will have the opportunity to visit the Normandie coast : Honfleur, Deauville, Cabourg, as well as Lisieux and the Cerza zoo, the Haras du Pin (literally the Pine stud farm) and many other historical and touristic spots. The area is also a great place to go to hiking, as it offers many dedicated paths. This guest house provides everything needed for young children: foldable beds, highchair, changing table. The garden is currently being landscaped. You will find everything that you need to know on this website as well as our name, address and phone number.